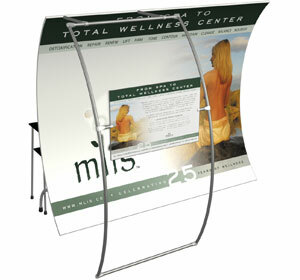 The Entasi™ system is undoubtedly one of the most attractive and effective portable trade show displays available. It combines a solid frame with beautiful graphics, and offers an extensive array of accessories and options. The main graphic is produced on a premium, environmentally friendly Green Knit™ fabric in sharp resolution and vivid colors. Exact ‘pillow case’ tailoring ensures a smooth fit and a light-stop backer eliminates unsightly shadowing. The aluminum framing and fabric graphic create an amazingly lightweight display that pack into small cases, making it highly portable and saving significant freight costs. Entasi™ is designed to set up easily by just one person within minutes — and requires no tools. The Entasi™ display system has been thoroughly tried and tested so you can be confident it will last for years to come. The fabric graphics are fully washable, wrinkle-resistant and flame retardant.